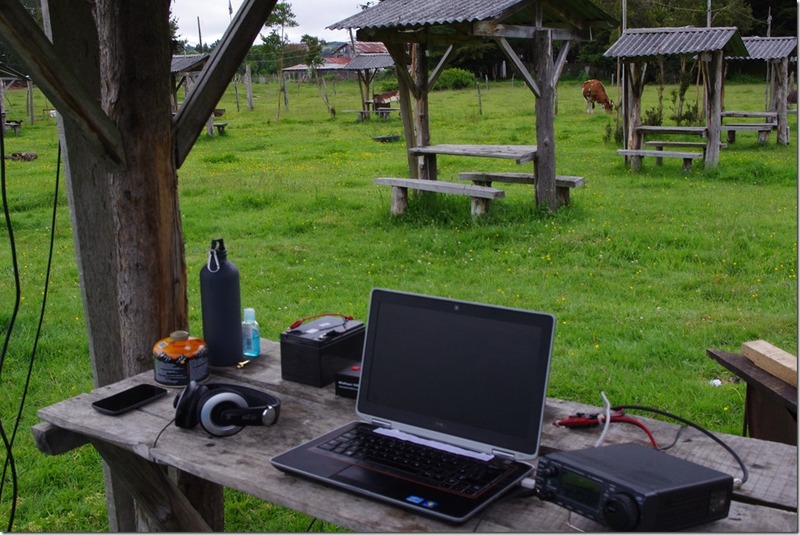 This post is about my entry from Chile in the CQWW CW Amateur Radio contest. If you’re not a radio amateur, and you’re just interested in following my travels in Chile, you probably want to skip this post in the series. Similarly, if you are a radio amateur and you’ve come here to find out about my contest entry, you may not realise this was part of a 6-week journey through the country. I was travelling light, which explains the lack of decent equipment! and that was it. I had brought my Bencher paddle (despite the weight!) but it had developed a dodgy connection and I hadn’t brought a soldering iron, so I wasn’t able to send manually. Unexpectedly, however, I did have the ability to recharge the gel cell on my camping pitch, which meant I was able to operate for longer than originally expected. Given the fact that I was under battery power, I had to keep the power down. I typically limited it to about 40W. For anyone who hasn’t tried to operate in a major contest with this restriction, it’s an interesting experience. I found myself pondering the optimum gap to leave between CQ calls, as every unanswered call was potentially wasted power. I also had to choose operating times carefully, of course, to allow time for recharging in the quieter periods. I’d listened to 15m the previous weekend (during Sweepstakes), while I was in Villarica, to aid this choice. My entry was SOSB on 15m, unassisted (there was no internet on the campsite). My limited station on the campsite, which is also a working farm, hence the cow in the background. The dipole was strung between a couple of the shelters. Conditions were broadly worse than expected, even given my limited equipment. I could tell I was a long way south, and far from most major centres of population. The European opening predicted by VOACAP around midday UTC was certainly there, and there were some fairly big signals from Europe but when called they either couldn’t hear me or, in some cases, got a partial call then gave up before getting the rest. Outside of the contest, it was good to work two friends in Cambridge (Martin G3ZAY and Rob M0VFC, both operating from the G6UW Cambridge University Wireless Society shack) on the Sunday EU opening, which proves the path was there with a bit of effort. There was a better opening to the USA in the late afternoon / early evening local time (around 21 UTC), which is where I got most of my QSOs on the Saturday, but not so many on the Sunday. Even when I could tell I had been spotted, it didn’t sound like I had many callers, though. I wonder whether that was me not hearing a pile-up, or whether it wasn’t there. So, what was with the strange callsign I was using? I’d been issued the callsign CE3/M0BLF via the Radio Club de Chile. Since I wasn’t staying in a single place during my trip, they kindly let me use the Radio Club HQ address for my licence address, which is why it was issued in zone 3 (Santiago). I wasn’t in Santiago for the contest, however. I was in the Región de los Ríos, most of which is zone 7. Hence CE3/M0BLF/7. If you had understood I was expecting to be CE3/M0BLF/6 in the contest, that’s correct. The different zone was a result of moving campsite unexpectedly. If you want to know why I moved, there’s more information on the Entre Lagos blog post. Although I was using batteries for the contest, I know that many radio amateurs like to know about mains systems for their own travels, so this bit is for you! Chile has a 220V, 50Hz mains supply, similar to most of Europe (but unlike North America). The plugs used are ‘Type C’, which I hadn’t come across previously. By design, Type C plugs have a very useful feature: the middle pin is the Earth and the two outer pins are Live and Neutral. These are identical in dimensions and separation to the continental European ‘Schuko’ standard, which means a European plug will work fine in a Type C socket, as long as you don’t need an Earth connection (and let’s face it, a lot of equipment is double-insulated these days). 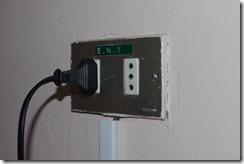 There is a catch, however: Chile is increasingly moving towards what I gather are called ‘Type F’ sockets. These look superficially identical to Type C, except that the Live and Neutral pins are physically blocked off unless the Earth pin is also present (this is also a feature of British Standard sockets, of course). 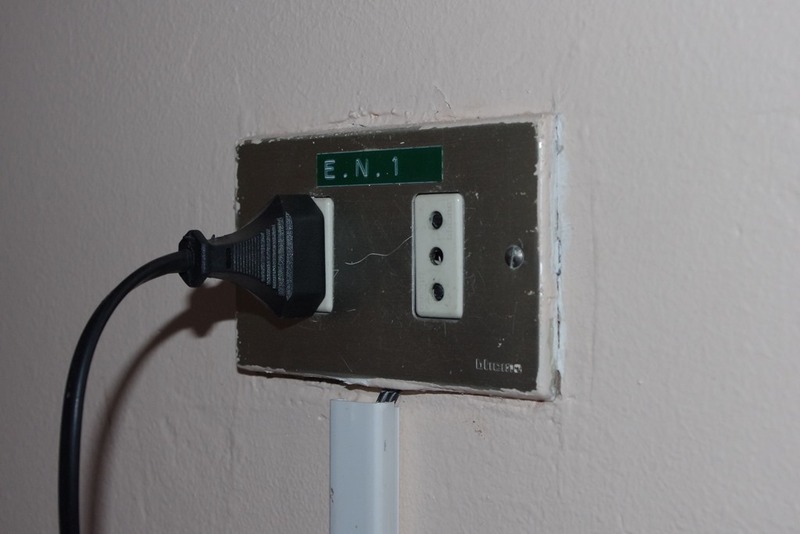 This means that standard Schuko plugs won’t go into a Type F socket, even though it looks the same as a Type C.
For guidance, I found that every hotel room – even more modern ones – I went to had at least one Type C socket in the room, but Type F were understandably more common in bathrooms and on campsites, for example. A casual look around some shops suggests that it may no longer be possible to buy Type C sockets for new installations, but I don’t know whether that’s just due to them only having Type F in stock, or by legislation. Anyway, when I did need one, I was easily able to pick up a cheap Schuko – Type F adaptor in a larger branch of the Jumbo supermarket, complete with Earth pass-through. I also bought a 10m Type F extension lead, which was useful for hooking-up at campsites during my travels.